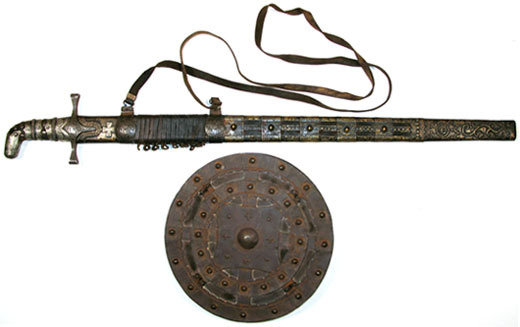 Georgian Khevsur people's traditional palash sword and associated shield. Eastern Georgia, late 19th century. Historically, Georgian highlander communities enjoyed a degree of autonomy. Khevsurs never accepted local lords; they elected their leaders or khevisberi (ხევისბერი, elder) and council of elders and submitted themselves only to the monarch. They were exceptional warriors with traditional Georgian qualities of courage, open and honest, fraternity, independence and love of freedom, who were often promoted as royal bodyguards. Kings regarded them as reliable guardians of the Caucasus Mountains and the northern border of the kingdom. 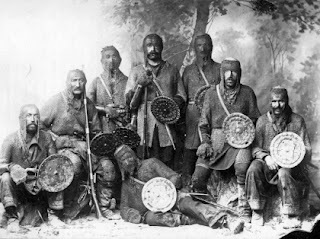 In the battles Khevsurs wore flags adorned with crosses and considered themselves permanent members of the army of the sacred flags and guardians of Georgian Kings. There has been a hypothesis, coming from the locals and descriptions by Russian serviceman and ethnographer Arnold Zisserman who spent 25 years (1842-67) during Russian expansion in the Caucasus, that these Georgian highlanders were descendants of the last European Crusaders because their folk culture – the material, social, and religious practices – greatly resembled those of the Crusaders. American traveler Richard Halliburton (1900-1939) saw and recorded the customs of the Khevsur tribe in 1935. (read the text below from his book "Seven League Boots"
Khevsurs are mentioned in Greek, Roman and Georgian sources before the formation of European crusades, and the pure European origin of Khevsurs is not supported by most modern scholars. However, some form of settlement of Crusaders in these areas is possible, as they are mentioned in several manuscripts of the time as participants of several battles against the Muslims in Georgia (100 "Frankish" Crusaders participated in King David's army in the Battle of Didgori), and the fact that some passed through here after the fall of the Holy Land. …in the spring of 1915, some months after Russia’s declaration of war against Turkey, a band of twelfth-century Crusaders, covered from head to foot in rusty chain armour and carrying shields and broad-swords came riding on horseback down the main avenue [of Tiflis]. People’s eyes almost popped out of their heads. Obviously this was no cinema company going on location. These were Crusaders – or their ghosts. One of the most curious and romantic legends of the Caucasus tells the story of the origin of this armoured tribe. And as yet no historian has found any reason to believe that the legend is not based entirely on fact. The story declares that this race came, eight hundred years ago, from Lorraine, more than two thousand miles away. The argument is borne out by the fact that their chain armour is in the French style, while their otherwise incomprehensible speech still contains six or eight good German words. 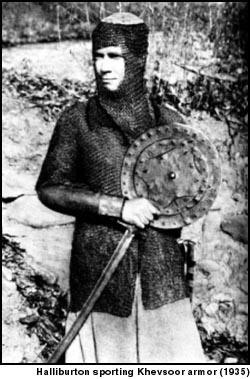 When they left Lorraine, so goes the legend, the last thing they had in mind was the colonization of the frosty peaks of the Caucasus Mountains, for they were followers of Godfrey de Bouillon and planned to wrest the Holy Sepulchre from the Moslem infidels. But during thee thousand-mile march across what is now Asiatic Turkey, this particular band of Crusaders somehow got detached from the main army, and were prevented by the Saracens from rejoining it. Whether they took a northern course of their own accord, and continued on across Armenia and Georgia to the Caucasus as pioneers, or whether they were fleeing for the lives with Moslem scimitars swishing around their ears, the legend does not say. 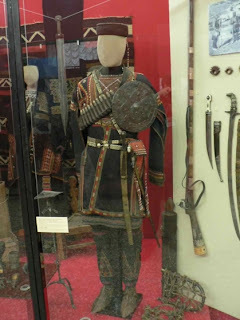 But we do know that they called a halt in one of the most rugged and unapproachable corners of the Caucasus… and didn’t emerge again in force till 1915 when the rumours of a worthwhile war brought them wearing their ancestors’ coats of mail into Tiflis. These strange people, called Khevsoors [Ed. Khevsureti], have continued to occupy their hidden corner for over eight centuries. But not one inch have they advanced in general culture. In fact, they have lost whatever of the arts they brought with them from Lorraine, and nearly all the crafts.